Jaguar Land Rover Classic enjoyed a double victory at the 2017 Octane Awards, held in London this week. The ‘Legends Continued’ Jaguar XKSS continuation was crowned 2017 Car of the Year and Jaguar Land Rover Classic also received the Manufacturer Heritage Collection of the Year accolade. Dubbed the ‘original supercar’, the XKSS was introduced by Jaguar in 1957 as a road-going conversion of the Le Mans-winning D-type racing car. Nine original XKSSs were earmarked for export to North America in 1957, but were sadly lost in a fire at Jaguar’s Browns Lane factory in Coventry that same year; meaning only 16 of the planned 25 examples were completed – until this year, when Jaguar Classic set about completing the missing nine cars. The Jaguar Classic team’s meticulous attention to detail, for a fiendishly complicated project, saw the XKSS secure the most votes from Octane’s magazine readers and website visitors. “It is a huge honour to receive such a prestigious award for the XKSS, 12 months to the day since the continuation Car Zero made its global debut in Los Angeles. Each of the XKSSs are assembled at the newly-opened Jaguar Land Rover Classic Works facility near Coventry, which houses Jaguar Land Rover’s collection of more than 500 vehicles – a living assembly of British motoring history. Collection vehicles are also available for loan to car clubs and museums, and for Jaguar Land Rover and its partners to showcase at events in addition to providing an invaluable reference for its authentic restorations. 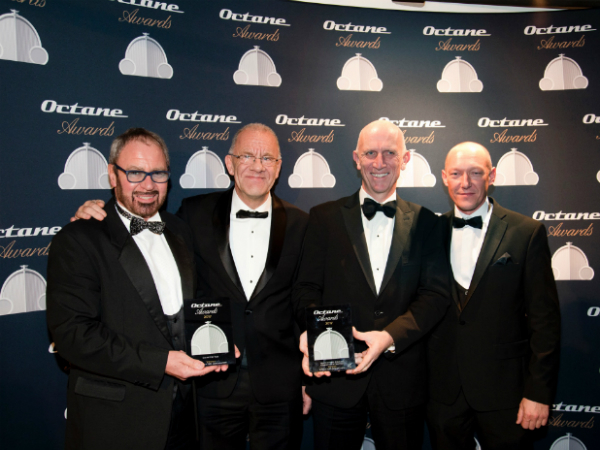 This year’s Octane Awards were judged by 22 renowned members of the classic motoring world, including five times Le Mans winner Derek Bell MBE, Pink Floyd drummer Nick Mason and TV personality Jay Leno. Pictured left to right: Neil Grant, Project Leader; Kev Riches, Continuations & Vehicle Engineering Manager; John Edwards, Managing Director - Jaguar Land Rover Special Operations; Richard Traves, Technician. CONTENT - Would you like to see Travel2Work, live park and ride and Shuttlebus information on TeamTalk?